Grand Rapids Mulick Park Elementary students play football during recess at Mulick Park. The School one-quarter of the city’s park inventory is owned by the school district. GRAND RAPIDS: Barbara McFall says the importance of having a neighborhood park where families can be active and interact with each other cannot be measured. A neighbor to the closed Lexington Elementary, McFall and residents who live by three other schools that closed will soon get to help design a space that would transform part of the land from schoolyards to neighborhood parks. Grand Rapids Public Schools owns a quarter of the city’s parks. The drawback to that is with the district right-sizing due to declining enrollment, the closure and sale of neighborhood schools can leave areas park-poor. The city is already below the national average in park acreage. 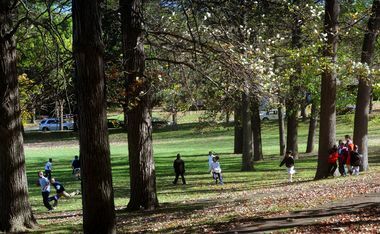 That’s why city planners, Friends of Grand Rapids Parks and the developer seeking to convert three of the schools into apartments are working together to preserve the green space. Bruce Michael, owner of Ojibway Development, has a $1.6 million purchase agreement with the district for three of the elementary schools and is donating land on each to the city. Oakdale school, at 944 Evergreen St. SE, was closed in 2003, while Lexington school, 45 Lexington Ave. NW, and Eastern school, 748 Eastern Ave. NE, were closed in 2008. Faber said school neighbors assumed the green space would always be there. He said the joint use facilities agreement between the city and school district, adopted in the 1950s. A formal offer canât be made yet on the Stocking School property, 863 Seventh St. NW, until the city declines first right of refusal. “Keeping the open space is positive for the community and an asset for the property,” said Michael, who added Minnesota’s Dominium Development and Acquisition is no longer a partner in the housing project. He recently submitted his special land use application to the city for his housing project. While optimistic, Faber and others say the parks effort wonât die if Michael fails to get approved. In a few weeks, neighbors will be invited to come to planning meetings to develop the park plans. Grand Rapids-based RJM Design is the landscape architect they will work with on the project. A decision made with a team of neighbors, including McFall. What kind of park will best complement your community? That’s the question for residents to ponder and share, said Faber. He said once they have the plans, they’ll have to acquire funds to execute them. “Developing urban parks involves multiple partners and multiple tools,” said Faber. McFall says she can envision her 9, 11 and 13-year-old running and playing with other kids in the park and the neighborhood, enjoying a movie night on the lawn.